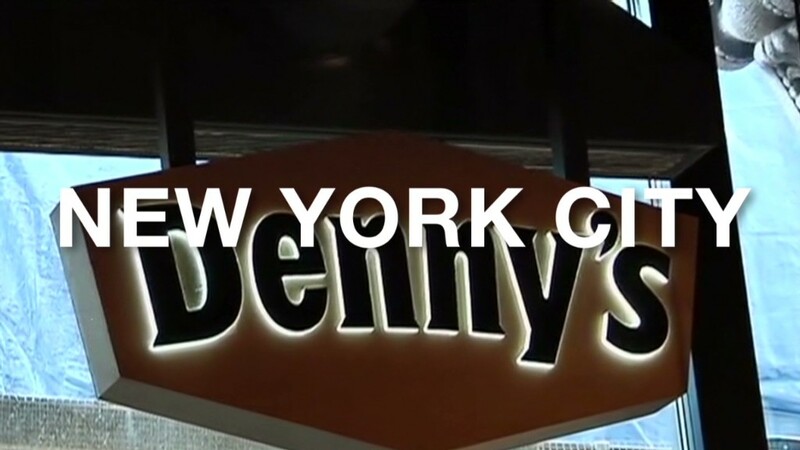 Denny's swung open its doors in a luxury apartment building in New York's City's financial district Friday morning. And it had every marking of trying to attract Masters of the Universes and ladies who lunch -- what was made to look like copper-stamped ceilings, exposed brick walls, faux Tolix chairs, and a full bar with artisanal bloody marys and prosecco on tap. Owner Rahul Marwah said he envisions the restaurant filled with a Wall Street crowd, given that it's situated at the gateway to the financial district. That's why he modeled the interior after local dining institutions like Delmonico's and Locande Verde -- both of which charge upwards of $30 for dinner entrees. The real proof that this Denny's is trying to be the highest brow of all the 1,700 Denny's is the $300 take on the traditional Grand Slam breakfast. The Grand Cru Slam takes the storied combination of bacon, pancakes and eggs and adds a bottle of 2003 vintage Dom Perignon champagne. The meal also comes with a high five from the bartender. Only the 1% didn't seem to be flocking there. In fact, residents from the ritzy condo building in which the restaurant is located filed suit last year to try and stop it from opening. At 8:30 a.m. on Friday, there was not a single suit in the restaurant -- business, Chanel, or otherwise -- apart from the one Marwah was wearing. The crowd mostly consisted of people in jeans or workout gear and members of the media. "It's a very New York-style Denny's, but it's still a Denny's," said Joshua Ness, a Texas native living in Brooklyn who grew up frequenting a Denny's that had floral wall paper and a glass case filled with cakes spinning on trays. The food, he said, was not much different. Ness and his friend Kelli Mears didn't order the Grand Cru Slam. Mears had chicken fried steak and Ness had some eggs. The $300 meal option is not something they'd order on a random Friday, he said. Their check came to about $30, and they were headed out the door to work, him at a start-up and her as an executive assistant. "It was a good breakfast, but I'm really sleepy now," she said. "Maybe chicken fried steak was a bad idea."